Abstract—The atmospheric concentration of carbon dioxide is continuously increasing. The residential sector have high rate of emitted carbon dioxide from the different sectors’ emission. This study try to show the beneficial effect of renewable materials compared to other silicon based building materials. 80 different house layouts were involved in the comparison, which were carried out with four wall types. The CO2 equivalences of the external walls were determined to each wall types and each house layouts. The most unfavorable CO2 balanced structures were the two silicate based materials, brick and concrete wall. These have surplus CO2 emission. While the light frame structure and the block house store more carbon (in CO2 equivalence) than these emitted during theirs production. Based on our analysis - beside sustainable sylviculture - the spreading of the wood framed and the block houses would have positive effect on the carbon dioxide concentration located in the air. Index Terms—CO2 emission, climate change, house walls. Z. Pasztory, P. Rébék-Nagy, and Z. Börcsök are with the University of West Hungary, Sopron 9400, Hungary (e-mail: zoltan.pasztory@skk.nyme.hu, peter.rebek-nagy@skk.nyme.hu, zoltan.borcsok@skk.nyme.hu). A. Zajáros is with ÉMI Non-Profit Limited Liability Company, Szentendre, Dózsa Győrgy út 26, Hungary (e-mail: azajaros@emi.hu). 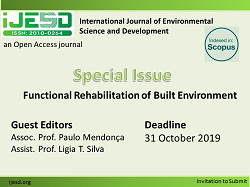 Cite: Zoltán Pásztory, Péter Rébék-Nagy, Anett Zajáros, and Zoltán Börcsök, "CO2 Balance of Wood Wall Constructions Compared to Other Types of Wall Structures," International Journal of Environmental Science and Development vol. 7, no. 2, pp. 109-112, 2016.